Berwick resident Evan Mallett, owner of the Black Trumpet restaurant, gathers flavors from other cultures while staying true to local ingredients. 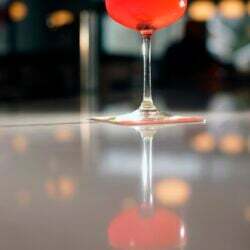 PORTSMOUTH — Whenever people ask Evan Mallett what kind of food he serves at his restaurant, Black Trumpet, he can never give them an easy answer. The chef’s food is an interesting blend of ethnic influences layered over a backdrop of New England cuisine, and made with as many local ingredients as possible, a reflection of Mallet’s devotion to the farm-to-table creed – a devotion also on display in the restaurant’s farm/garden, his promotion of heirloom seeds and his interest in foraging. On a recent, chilly winter evening, pots of fish stock, rabbit stock and veal demi-glace simmered on the stovetop in the restaurant’s small kitchen. Mallett cut up a heritage breed New Zealand white rabbit from a Maine farm for his Mountain Paella – chicken mole meatballs, chorizo, rabbit, snails and mushrooms simmered with Spanish rice. Behind him, two cooks shelled peanuts for an experimental dish, Mallet’s take on West African peanut soup, an African-Mexican hybrid containing okra, onions, garlic, Berbere spice mix, chiles, cilantro and Nantucket bay scallops. Mallett, 48, gathers much of his inspiration not from fancy food in expensive restaurants, or from celebrity chefs, but from other cultures’ food traditions. He is always on the hunt for new flavors. To answer that frequent question – what kind of food do you serve? 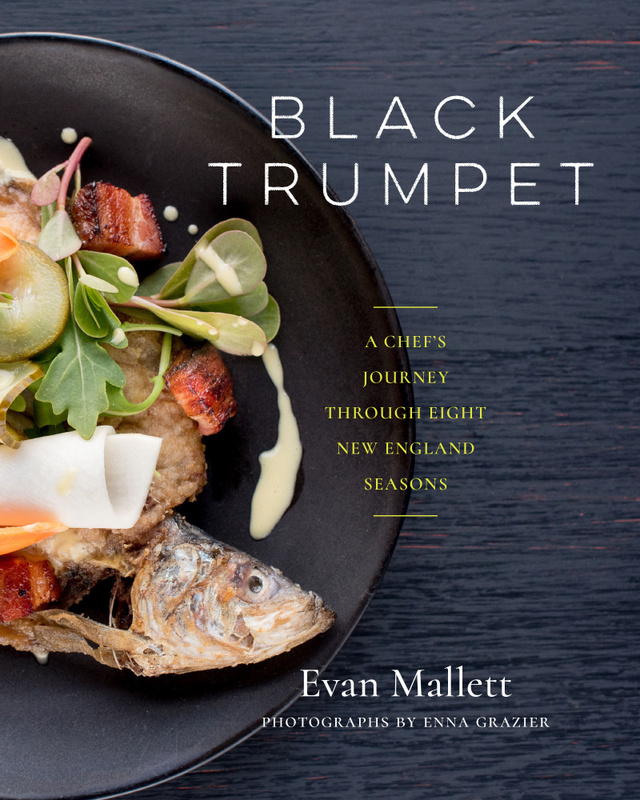 – Mallett recently published his first cookbook, “Black Trumpet: A Chef’s Journey Through Eight New England Seasons.” Each of the four seasons is divided further into early and late spring, early and late fall, etc. The book targets “the ambitious home cook,” Mallett says, but he tested recipes over more than nine months to make them as accessible as possible. Still, he knows that not everyone will want to shop for and cook with, say, rabbit. Mallett attended seven different colleges but never got a degree. 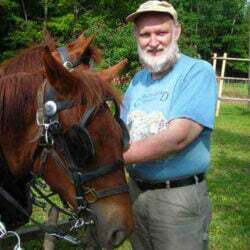 He was an English major and French minor, then abandoned both to study marine biology. He was living in the Washington, D.C. area in his early 20s when he began working in restaurants to help pay for school. 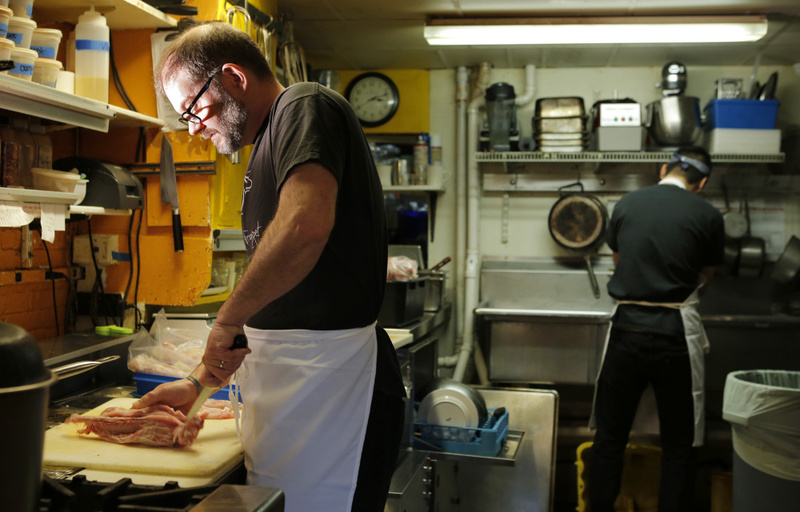 He parked cars and cleared dishes before a chef coaxed him into the kitchen. Mallett got just far enough along to get a taste for the work before he decided to focus on completing his studies. Chef Evan Mallett prepares rabbit for dinner in the kitchen of his Portsmouth, N.H., restaurant, the Black Trumpet. “I’m pretty adamant about sourcing from within New England, and from New Hampshire and Maine whenever possible,” he says. The couple was living in Concord at the time and thinking of starting a family. Mallett’s grandfather lived in Portsmouth and was ill. The dinner at Lindbergh’s Crossing helped tip the balance, and they moved to Portsmouth, where Mallett landed a job at Lindbergh’s Crossing. He worked there, and later as sous chef at its sister restaurant, Ciento, until 2001. That year, a perfect storm hit: Terrorists attacked on Sept. 11, Mallett’s wife lost her job, and Ciento closed. The couple had a newborn daughter to support, so when a job offer in San Miguel de Allende, a city in central Mexico, came along (courtesy of a flamenco guitarist who had played at Ciento), the Malletts jumped at the opportunity. Mallett knew only “eight words of very vulgar kitchen Spanish” when he arrived, but within six months found himself conversant in the language. They stayed for nearly two years and still return once a year. When Mallett’s former employers in Portsmouth invited him to return, he and his wife moved back and bought a home in Berwick, where they still live with their two children, Eleanor, 16, and Cormac, 13. 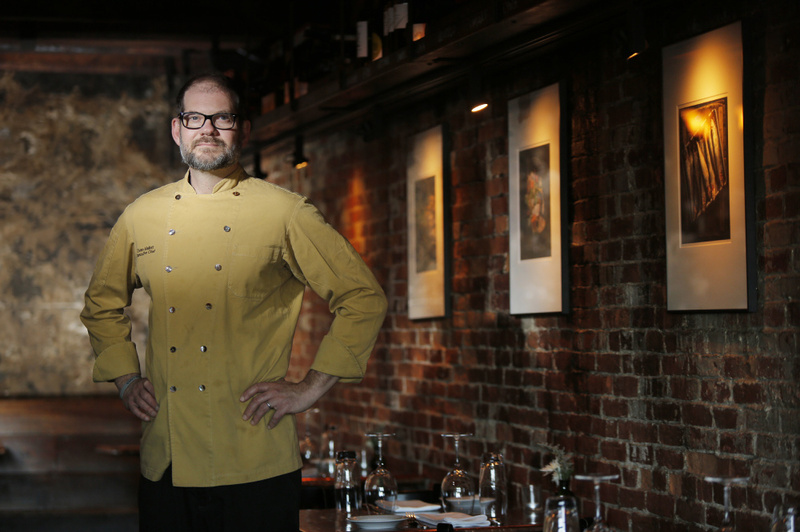 Mallet became executive chef at Lindbergh’s Crossing. Three years later, the owners asked the couple to take over the restaurant. 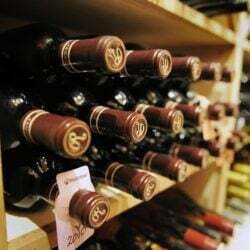 They agreed, and transformed the restaurant, which had served cuisine from the south of France, into the Black Trumpet. The cozy downstairs dining room at Black Trumpet peers out over the harbor at sidewalk level. Guests can see the riverfront and the Fort Macon tug standing guard – an even better view is available in the upstairs dining room. Downstairs, where the kitchen is located, the long, narrow dining room is filled with small copper-topped tables and huge, dark, wooden beams stretch across the ceiling. The narrow fireplace hasn’t worked since the 1800s, according to a server. Along one old brick wall is a long shelf filled with wine bottles; below them, a line of photographs of fish, seaweed and, of course, black trumpet mushrooms. Shortly before opening for the evening, Mallett brings out a pot of shrimp and meatball gumbo for the staff meal and explains the additions to the night’s menu, which are listed on a chalkboard that sits on the fireplace mantel. A meze plate holds a trio of tastes, including veal Bordelaise, an achiote-rubbed tenderloin, and a creamy beef empanada. The achiote spice blend is house-made – the Mallets also own a spice store called Stock + Spice next door. The tenderloin is seared rare and served with a dab of crème fraîche. Sampling the plate reveals how the spices build in heat, from left to right. It’s a warm heat that complements the food, never overwhelming. Among other items on the chalkboard are pork rillettes made with a mulefoot hog’s head from Washington County, Maine. Small plates include local oysters Bienville, and the fish for the evening is local dayboat cusk. 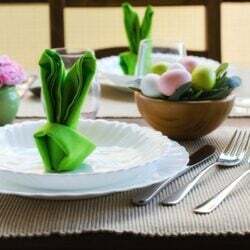 The menu includes a wide variety of small and medium plates. Entrees range from $19-$32. 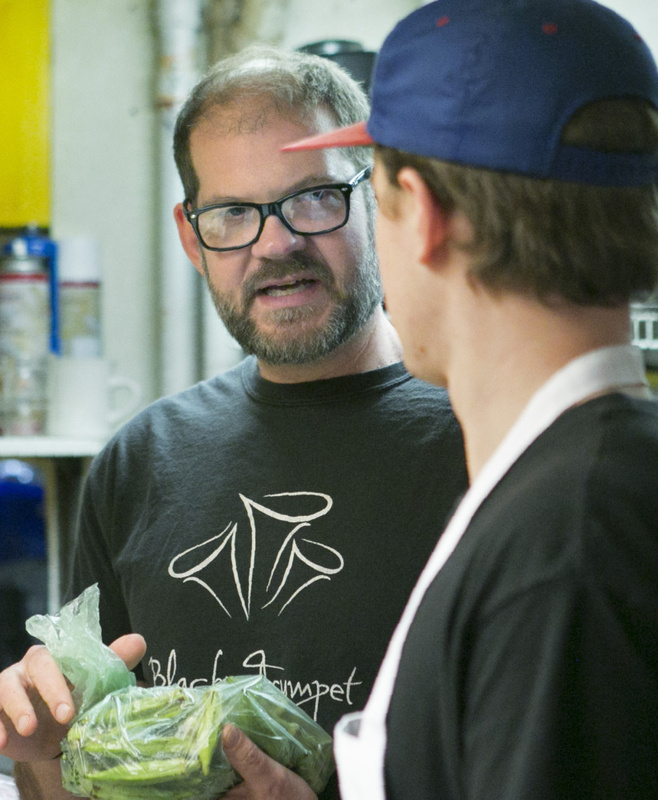 Over the years, Mallett has earned a solid reputation as an advocate for what he calls the “Good Food Revolution” and for using only the freshest, local foods. “I’m pretty adamant about sourcing from within New England, and from New Hampshire and Maine whenever possible,” he said. Mallett sits on the boards of Slow Food Seacoast and the Chef’s Collaborative, a national nonprofit network of chefs and food professionals dedicated to food sustainability, access to good food, and building a better food system. Black Trumpet has its own garden, which began as a raised bed in a community garden on the grounds of Strawbery Banke. Today it’s a three-quarter-acre organic plot at Meadows Mirth Farm in Stratham, 10 to 15 miles from the restaurant. It has spawned another food system-building project called the Heirloom Harvest Project, co-founded with Josh Jennings, the owner of the farm. Once a year the Heirloom Harvest Project shares heirloom seeds with local farmers, for free, and connects them with chefs. Rare varieties that have been targeted by the project include Roy’s Calais flint corn, Longpie pumpkins and Gilfeather turnips. “He has an almost childlike wonder, in the best way, about the food world around him,” she said. Consider it one more lesson learned about an ingredient that grows in New England – an ingredient that, when it makes its way into Mallett’s kitchen, will likely find itself enhanced by flavors from another land.